The emerald shiner belongs to a genus that contains about 100 species of minnows commonly called shiners. 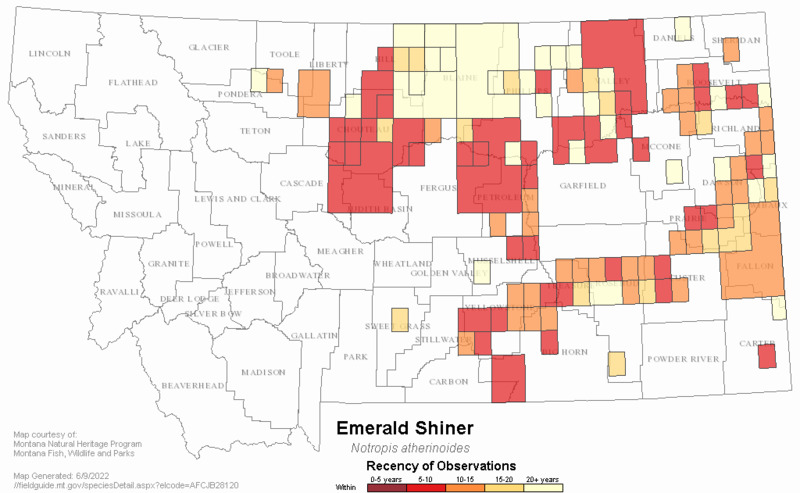 Emerald shiners are schooling fish native to the Missouri-Yellowstone River basin. They seem to prefer the larger prairie rivers and the open central waters of impoundments. Fish with this type of habitat preference are called pelagic. In some areas of the U.S., this fish has been widely introduced for forage; that is, as food for the larger predatory game fish. 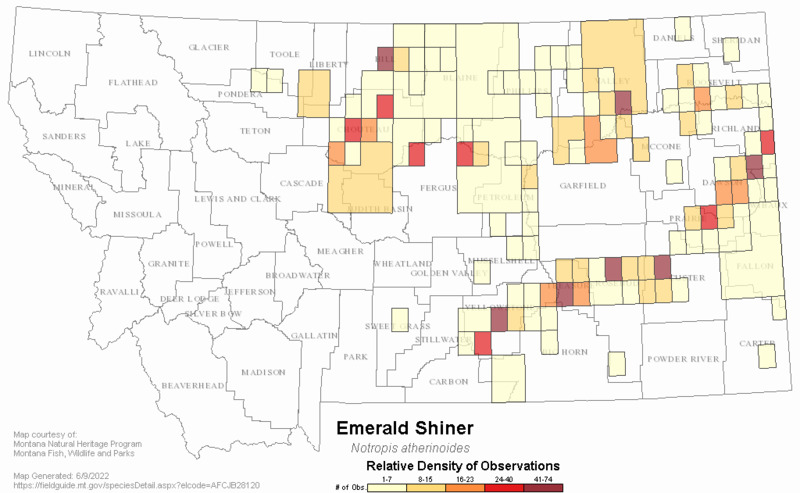 Although they are of lesser importance as prey in Montana, emerald shiners do have some value as a commercial bait fish in eastern Montana. They grow to about 4 inches in length. Overall silvery with iridescent light green back. Usually has an emerald green or silvery midside stripe, particularly toward the rear. Young are somewhat translucent. Eye large. Body slender and flat sided, fragile looking. Scales easily rubbed off. St. Lawrence drainage, Quebec; Hudson River drainage, New York to Mackenzie River drainage (Arctic basin), Northwest Territories, and south through Great Lakes and Mississippi River basins to Gulf; Gulf Slope drainages from Mobile Bay, Alabama, to Galveston Bay, Texas (Page and Burr 1991). Montana Range: Native in the Yellowstone and Missouri River drainages, introduced elsewhere, especially the Bighorn River. Preferred habitat is larger stream channels and their impoundments. They are pelagic and avoids areas with aquatic vegetation. Prefers main channel border as specific habitat type. In the Wild and Scenic Section of the Missouri River upstream of Fort Peck, seining on the slow-water edge of a deep run captured the most emerald shiners (D. Stagliano, pers observation). Food consists largely of zooplankton and small aquatic insects eaten in the water column; but some algae and terrestrial insects have been found in emerald shiner stomachs. Important food item of sport fishes, particularly burbot, rainbow trout, walleye, sauger and northern pike. Sexually mature at 2 yrs. Spawns in July - August. Spawning has been shown to peak mid to late July in middle Missouri River study. 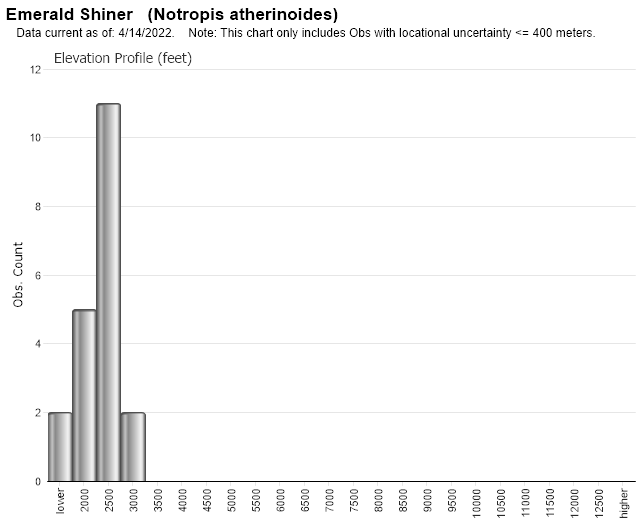 Web Search Engines for Articles on "Emerald Shiner"